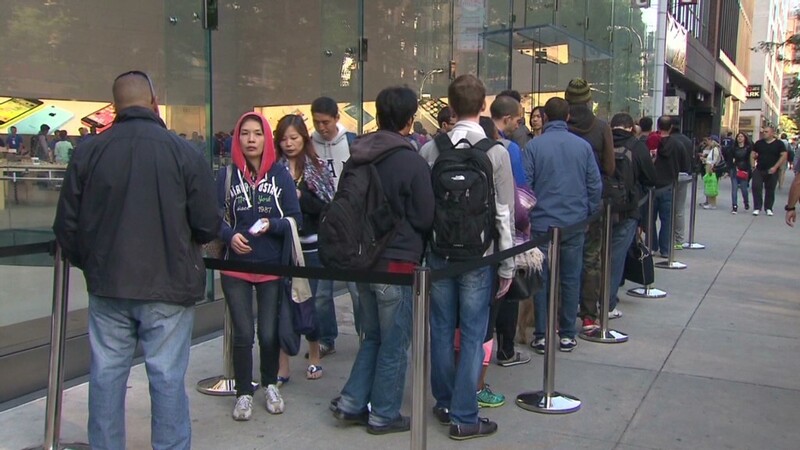 The line outside Apple's flagship New York store stretched for blocks as consumers waited for the new iPhones. This was a common sight at other Apple stores around the world. The annual holiday for Apple fans is here. The new iPhones went on sale in the U.S., China and seven other countries Friday, and throngs of people lined up around the world to be among the first to snag one. Outside Apple's flagship New York retail outlet on Fifth Avenue early Friday morning, the line wrapped around the store and then stretched for more than three city blocks. Apple employees high-fived customers once doors opened at 8 a.m. The crowds for new iPhones is draw a mix of Apple diehards and more casual fans, plus people hoping to resell the devices for a profit. A few marketers are also on hand, hawking their wares to the masses waiting on line. In New York, one man wearing basketball shorts was handing out cards and asking people to check out his son's app. Staffers from trade-in service Gazelle walked around handing out free pretzels. Another man, who was not on line, just kept screaming, "Is anyone excited for the iPhone? Is anyone excited for the iPhone?" The crowd seemed mostly annoyed. Some people even paid line-sitters by the hour to grab an early spot. Why the fuss? For the first time, Apple (AAPL) is offering two new iPhones: the flagship 5S and the cheaper, plastic iPhone 5C. The iPhone 5S is similar in appearance to last year's iPhone 5. The new device is faster than its predecessor, however, and it features hardware upgrades like a beefed-up camera and a processor that measures motion data. The iPhone 5C comes in several different colors. The flagship iPhone 5S wasn't available for pre-order. That annoyed Lance Smith, a fan who was one of the first 100 in line in Atlanta's Lenox Square shopping mall. "That's the only reason I'm in line, so I can get it on day one," he said. "They definitely screwed it up for a few of us by not preselling the 5S." Others brushed off that inconvenience, focusing instead on the new features. Ana Ramirez, who began waiting on line in New York at 4 a.m., said she was excited to try out the new Touch ID fingerprint sensor on the 5S. "I get the iPhone every year. It's just the best phone, hands down. Apple made it, so I know it will be the best," she said. Not everyone waiting in line will get an iPhone on Friday. Apple Stores usually have the most in stock, but they also draw the longest lines. The gold iPhone 5S seemed to be the most popular choice for the iPhanatics. Georgia Tech student Chance Shafor, the first in line in Atlanta's Lenox Square, said he wants a gold iPhone 5S because it's "new and shiny." Retailers including Best Buy (BBY) will also have the new iPhones, as will carriers AT&T (T), Verizon (VZ), Sprint (S) and T-Mobile (TMUS). But their inventory usually sells out more quickly. 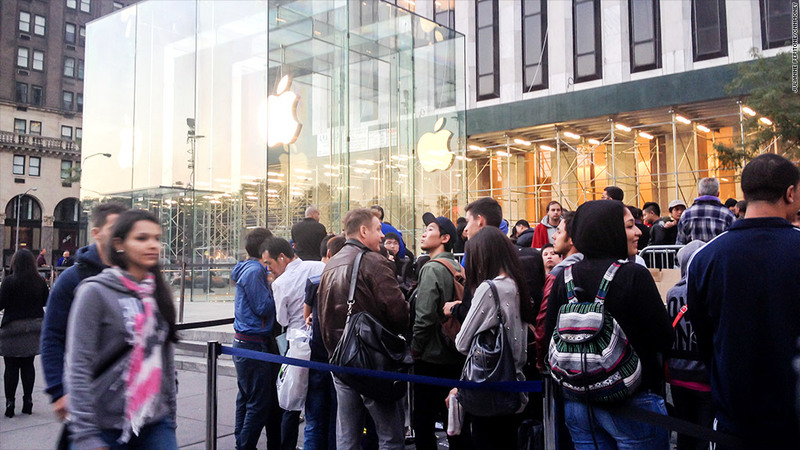 5S sells out in London: Scores of Apple fans in London went home disappointed after the iPhone 5S sold out at the city's flagship store in under two hours. The gold version of the 5S was first to go as several thousand people lined up outside the store on Regent Street. After standing in the queue for six hours, London university student Waleed Tariq was pleased to have snapped up a 5S, dismissing the more affordable model. "The 5C stands for 5 cheap. It's plastic and it looks cheap. I'm definitely not interested in that one," the 17-year-old said. Apple staff estimated that the number of people waiting matched previous releases. Queues in London, mostly made up of men, snaked down a side street and were funneled into a nearby square. Coffee stations were set up to serve the waiting crowds. Many in London were buying iPhones just so they could resell them later, though Apple imposed a two-phone limit on customers. Some of those sellers pitched tents outside stores for days on end. Noah Green became the first person in the U.K. to buy the iPhone 5S after camping outside the store since Monday night. He and his friends took showers at a nearby gym and used an Apple-supplied umbrella to shield them from the rain. "I wanted to be first. I've always been in the top ten but never first. Honestly this is the best feeling in the world," Green said. Green said someone offered him £300 (about $480) for his place in line. He turned them down but admitted he would have sold his spot "if someone wants to offer the right price." So what would be the right price? "Ten thousand pounds," Green said. "I know it sounds crazy, but people will pay that price." -- CNNMoney's Virginia Harrison and CNN's Stephanie Ott contributed reporting from London, and CNN's Todd Leopold reported from Atlanta. Which Fastest-Growing industry sector is the wise investment?